One of the most fun activities in Vietnam is visiting a local market and there’s no better place to flex your haggling skills than Ho Chi Minh’s most famous market. 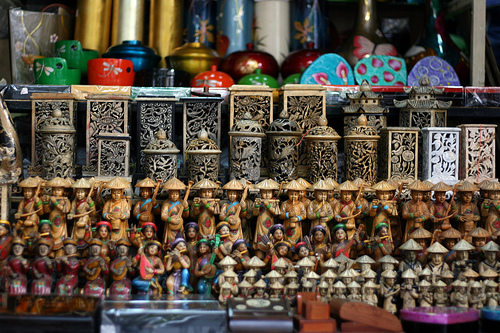 The Ben Thanh Market in District 1 is home to more than 3000 stalls. It’s best to visit at night if you want to avoid the city’s excruciating day time heat because chances are you will spend a couple of hours exploring the vast array of products on display. One of the things that makes Vietnam stand apart from other countries in the region is their coffee obsession. The French may have colonized Vietnam years ago but their influence can still be seen in modern day Ho Chi Minh, especially with the coffee culture. The specialty here is the iced coffee which is known as “ca phe sua da”, an iced coffee which is brewed over a slow French drip filter. The liquid is then poured over ice and served with a thick layer of condensed milk. When you are standing on the bustling streets of the city and melting from the intense humidity, there is nothing more addictive then throwing one of these down. One of the things you will notice when visiting Vietnam is that remnants of the war still lingers in the air today. For those who want to dive into their bloody history, it’s worth checking out this extensive network of underground tunnels. 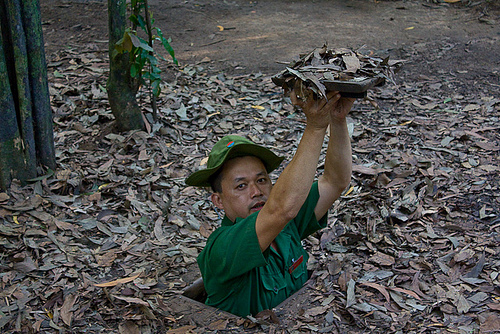 Located just 30 kilometres from Ho Chi Minh City, the Cu Chi tunnels were used by the Vietcong during the war to hide out and defeat American troops. There are guided tours available which goes into detail about the history of the tunnels and you can even climb down yourself if you’ve ever wondered what it’s like to feel claustrophobic. Have you ever wondered what it’s like to munch on mouse meat? Or maybe you’re just craving for some of that snake wine? For the adventurous foodies out there, Ho Chi Minh city is one of the best places for you to try out weird food. A good source of information is your hotel. Simply ask them for a good local spot to eat some of these strange creatures and they will be able to point you in the right direction. If you are looking for animal wine, keep your eyes open at the markets as glass bottles of snake wine are displayed everywhere. Forget the rollercoaster. Zipping back and forth through the organized chaos that is Ho Chi Minh city on the back of a Vespa is probably one of the most exhilarating experiences on offer. There are various scooter tours based on various themes such as food, historical sites or nightlife. This is a great way to explore the city with a local guide who can take you to hidden spots all over the city. Please note that if you do hop on a scooter, it is compulsory to wear motorbike helmets in Vietnam.